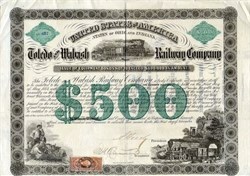 Beautiful SCARCE certificate from the Toledo and Wabash Railway Company issued in 1862. 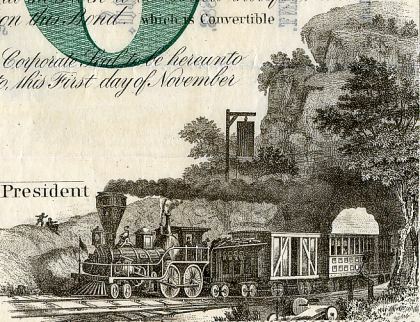 This historic document was printed by the Henry Seibert & Bros. Company and has an ornate border around it with a vignette of a train exiting a tunnel carved out of the mountain. This item has the signatures of the Company�s President and Treasurer, and is over 147 years old. Some sighs of wear. The name Wabash Railroad or Wabash Railway may refer to various corporate entities formed over the years using one or the other of these two names until the name disappeared in 1964 when the Norfolk and Western Railway leased the Wabash System. The first railroad to use only Wabash and no other city in its name was the Wabash Railway in January 1877 which was a rename of the Toledo, Wabash and Western Railway formed on July 1, 1865.